Do you need information about mobile mixers? Researching mobile concrete mixer manufacturers will help you find the best company to address the needs of your business. For almost 50 years, we have sold thousands of mobile and stationary concrete mixers and work with hundreds of customers each year to find the correct solution for their business. Cemen Tech has experienced growth in many different industries and has many customers in over 50 countries. Our customers have benefited from decades of concrete expertise and education with many types of construction segments. Many ask us who some of our competitors are in this industry. We figured we would save you some time and make you aware of who those companies are. We are eager to help you learn more about mobile concrete mixer manufacturers and address any of your questions. Zimmerman –Zimmerman founded by Harold Zimmerman, who developed the Zim Mixer in 1979 has been focused on the mobile volumetric mixer market, cement silos and serves many segments of the construction industry. The Zim Mixers are the only volumetric mixers that use a chain drive system. ProAll – Based out of Alberta, Canada, Proall recently combined with Pro-Ject, manufacturers of high performance oilfield and agricultural equipment, to form ProAll. ProAll’s Reimer Concrete Mixers have several volumetric mixer models available as well as trailer mounted mixers. Holcombe – A manufacturer of volumetric mixers, batching systems, precast mixes and silos has a patent-pending “Friction-less Conveyor System” and is based in Ault, Colorado. A family owned company, Holcombe Mixers is committed to honoring God by serving their customers with products that make high quality concrete across the world. Bay-Lynx – Ontario, Canada based Bay-Lynx is a full service machinery and attachment manufacturing facility. Bay-Lynx manufactures stone spreader conveyor units, beam cambering machines, snow plows and de-icing equipment, custom fabrication and a few years ago started manufacturing the Newman Volumetric Mixer selling out of Canada and focused on the market in the United Kingdom. Omega Concrete Mixers – Omega Concrete Mixers started in 2013. They utilize Schuler Manufacturing in Griswold, Iowa to build their volumetric mixers. Omega’s modular mixers produced by Schuler have been on the market for the past couple of years and are available in 6, 8, 10-12 yard units. So there are five mobile mixer companies to consider as you research, gather your needs and learn more about what to consider when gathering information about mobile concrete mixers. 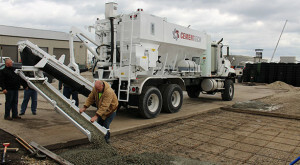 Are Mobile Concrete Mixers Batch Plants? Finding the right solution – Ask the right questions to ensure you get the correct equipment. Application expertise – Who can help with mix designs and has a good understanding of your application needs so multiple projects can utilize the same piece of equipment? Training needed – What support and education is available in the classroom and in the field before and after the sale? Look at overall ROI – How long will it take you to make a return on your mobile concrete mixer investment? Engineering/Technical support – What support is available via phone, online and in the field? Parts – Who has all of the parts needed to keep your mixer running to decrease your downtime and keep it running for years? Have questions? Contact a Concrete Solutions Specialist!